What Author Would You Want to Meet? In the hopes of crossing off a dream goal from my bucket list, I went to a special “meet and greet” of the authors that make up The Rock Bottom Remainders band. 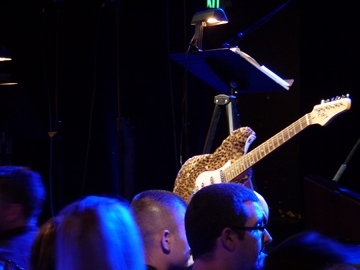 This was to be an hour-long reception preceding the concert at the El Rey Theatre. 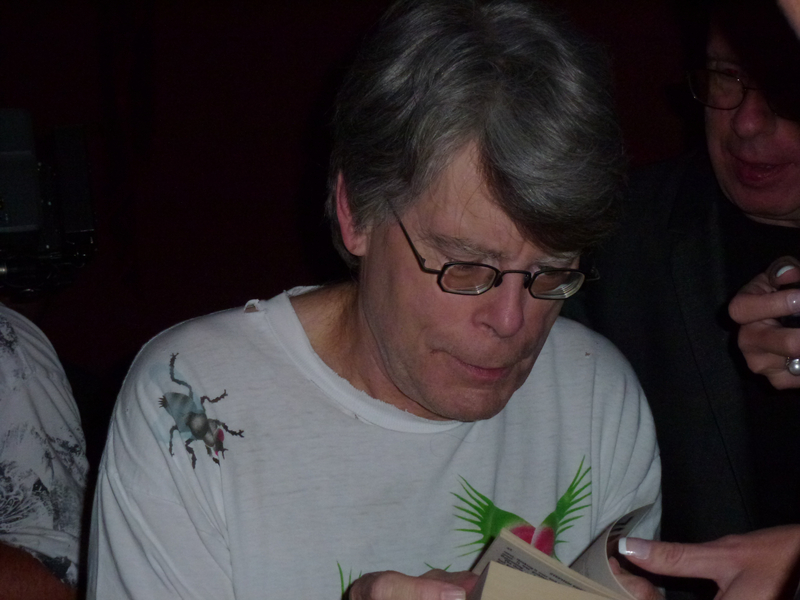 I wanted to meet several of the talented authors, but of course the holy grail for most of us was to meet Stephen King, (author of dystopian novels, among others) who rarely makes appearances anywhere, especially on the west coast. There was no description of how this was going to be set up, but I imagined we might be sipping drinks and chatting, however briefly, with the authors. I figured it was clear this was not a signing, so I didn’t want to be gauche and bring a book. No, this was a “meeting,” and I would be thrilled just to meet him, even for a few seconds. Or at least, I thought, they’d let us get a photo with him, even if we don’t get to talk. If I could just get a photo, or get to meet him, I’d go away happy. When we went inside the theater, he was nowhere in sight. Someone said they had seen him duck through a stage door, going backstage. Wrong way, Stephen! Because they let us in late, this was already 15-20 minutes into our meet and greet hour. A few authors were visible, you couldn’t miss the rocked-out Amy Tan, who walked up to a nearby balcony level that was only a few steps higher than the floor. But no one wanted to leave their coveted position in a haphazard line that snaked to the narrow path that led to the stage entrance. We were waiting for The King. Matt Groening came out and was placed at a table across the way where an orderly line could be formed to see him. People flew out of our line to join that one, allowing us in the King line to move forward. But still we waited. A reporter with a TV crew went through the stage door and later emerged. Shortly after, the bright light of the camera illuminated Stephen King as he appeared from that door. He had one assistant who had the difficult task of trying to maintain control. Immediately people started thrusting books in Stephen’s face and just as fast, he signed them. Oh, so this was a signing, after all. He had no time to talk, let alone look at anyone. He just signed books from whoever was around him in a 360 radius, including those who suddenly appeared from the balcony. There was no organization or forethought to this madness. The crowd was not rude, they just needed a better setup. Because all took place in such a narrow area, there was no easy way for people to leave. I snapped a few photos of King while I waited. I saw I wasn’t going to get my “meet” and somewhat begrudgingly pulled out the only paper item I had in my tiny concert-going purse – a STARTERS bookmark. I handed it to him and without looking at me, while someone else was shouting at him, he scribbled his signature. The whole time he was there was less than five minutes before his handler wisely chose to take him away, so I am grateful that I got photos (even if they weren’t of the two of us) and the autograph (even though it wasn’t in a book). What I really missed was not getting to meet him. I did get to meet other authors though, because they stayed out on the floor for the full hour. Dave Barry (Peter and the Starcatchers, one of his YA books) and his family were a special treat – what a wonderful writer. The concert that followed was fun. Yes, they messed up (Wild Thing). Yes, Stephen really cannot sing, but he tries with such earnestness. 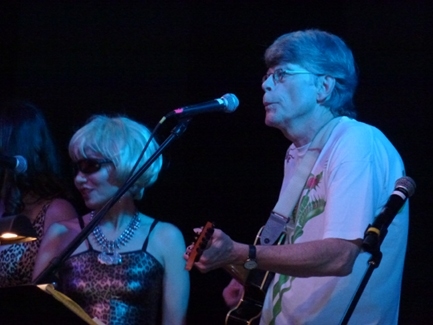 Besides, it is Stephen freakin’ King so you’re just thrilled to see him do anything up there. Amy Tan was fun doing her number “These Boots are Made For Walkin’. They had a truly talented musician in Greg Iles on guitar who used to be a touring musician. 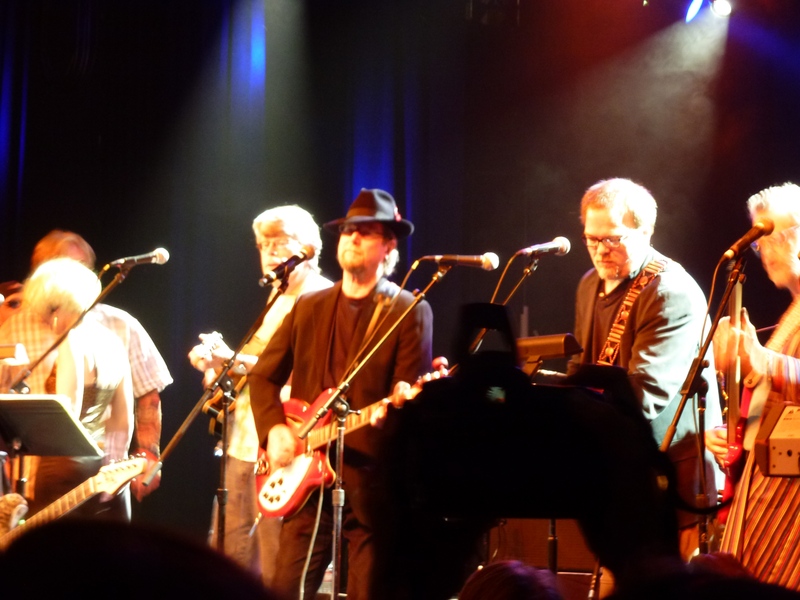 Many of the others were pretty good, and they had a special guest, Roger McGuinn of Byrds fame, whose guitar sounded like melted gold poured over chocolate. When they all sang together with him, it was magical. Somehow seeing all these authors on stage made it seem like the revenge of the nerds, that even writers could be a rockstars, at least for a night. It felt good. What author would be on your bucket list to meet someday? Stephen King is still on mine.